Although your toddler needs about 10 to 13 hours of sleep each day, it is still common for him to wake up in the middle of the night. 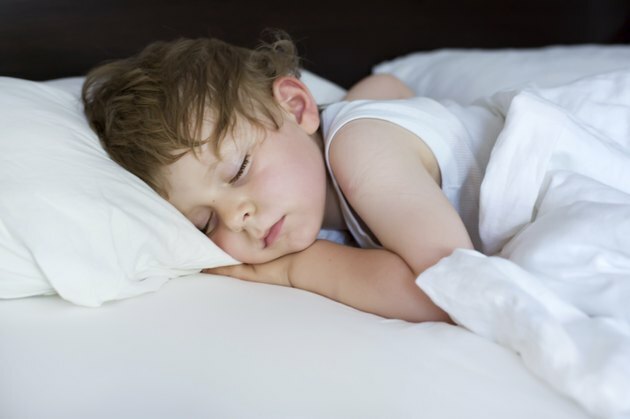 These night wakings can be frustrating, especially since many parents think that phase is over once their child learns to sleep through the night. In order to help your toddler sleep all night, it is important to understand what can cause night wakings. Your toddler has a growing imagination and a difficult time distinguishing reality from fantasy, so it is common for her to have bad dreams. If she wakes up and tells you that she had a bad dream, reassure her and make her feel safe. If she wakes up screaming and appears to be confused, she may be experiencing a night terror. Pediatric sleep disorder expert Deborah Lin-Dyken, M.D., states that the best thing to do if your toddler is having a night terror is to let it run its course. Stand nearby to make sure she doesn't hurt herself, and she will go back to sleep. If her night terrors persist, talk to her doctor. Environmental changes can cause your toddler to wake up in the middle of the night. Now that he is older, he is increasingly aware of his surroundings. If his room is too bright due to an outside street light or too cold, do what you can to make it a quiet, calm place for him to sleep. You might consider getting him darker curtains and shades, offering a blanket or using a white noise machine to make it a peaceful environment. Night wakings can be common after an illness or another change in routine, such as a vacation. It only takes one time for your toddler to wake up in the middle of the night for her to make it a habit. Be as consistent as possible with her bedtime routine, and reduce interaction with her when she wakes up. This will help her to understand that it is time to be sleeping. An upcoming developmental leap can cause your toddler to begin waking up during the night. In this case, it is best to let the situation run its course and remain consistent with bedtime. According to Kids Health, separation anxiety can also cause him to wake up in the middle of the night. In this case, you can offer brief reassurance and then wait for him to fall back asleep. In addition to bedtime routine consistency, you can also reduce night wakings by helping your toddler to get enough sleep during the day by giving her regular naps and putting her to sleep at a reasonable time. The less sleep she gets and the more overtired she is, the more trouble she may have settling down and staying asleep. Babycenter: Why is My Toddler Suddenly Waking Up Hysterical at Night?